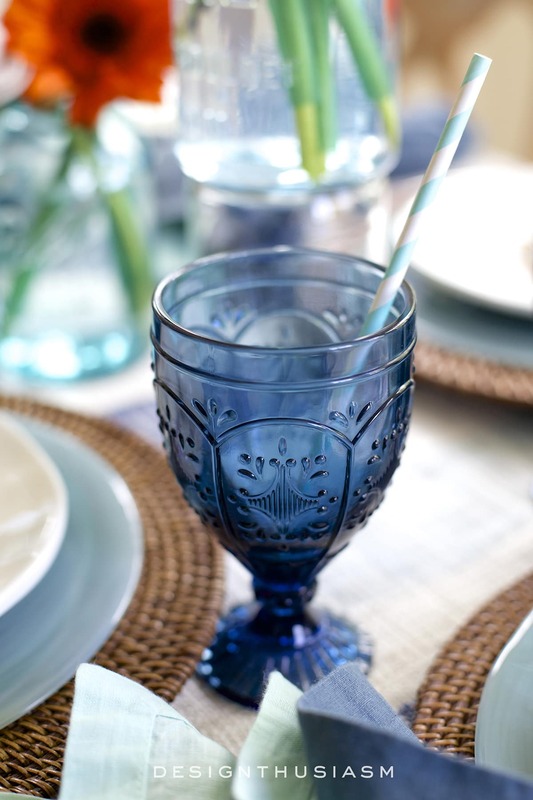 Welcome to the June edition of “It’s All Set”, a monthly tablescape series brought to you by some of my favorite bloggers. 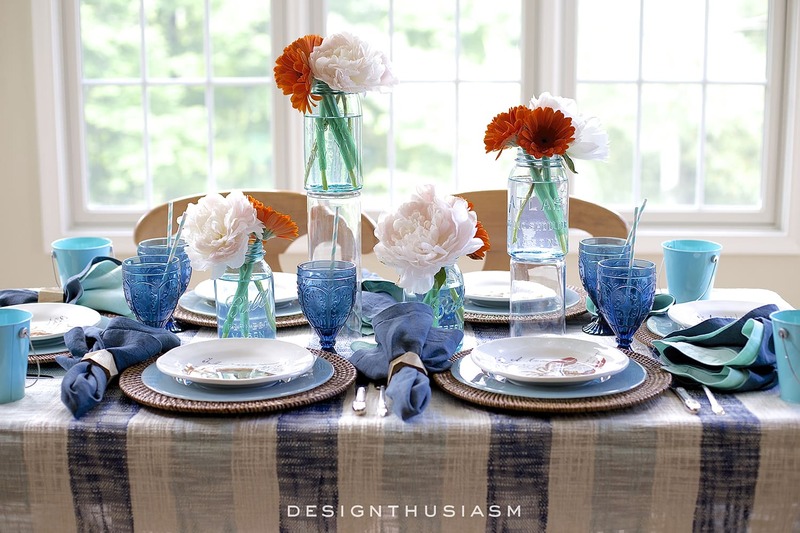 You can find the links to the other tables at the bottom of this post, but first, a look at my June Tablescape • Indigo Clambake. 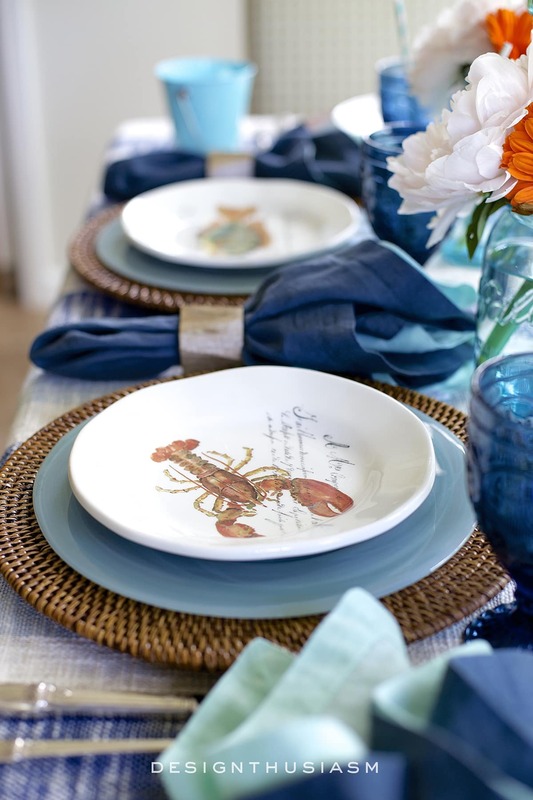 This month, I’ve chosen to focus on a summer theme, with seafood imagery and a coastal palette driving the concept. 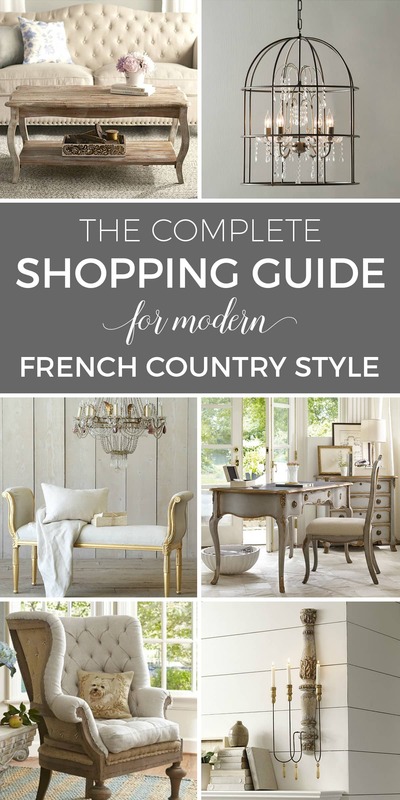 I wanted to go very casual with rustic and vintage elements, as well as some playful whimsy. My Americana palette began with a sunbaked russet and washed out indigo, reminiscent of faded barns and bluejeans, to welcome the beginning of summer. 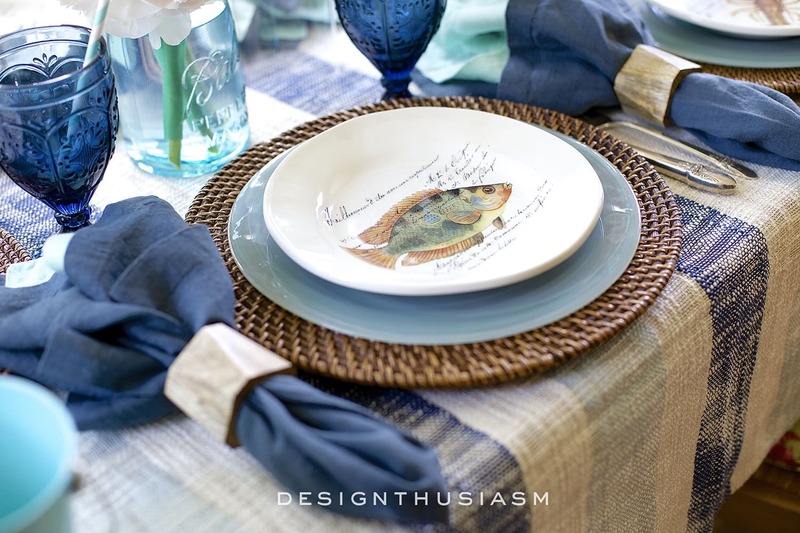 The plate stack is a mix of all these wonderful components, with a rattan charger foundation giving a nod to nature, turquoise alabaster dinner plates representing the sea, and topping it all off, Italian sea life salad plates have varied artwork. 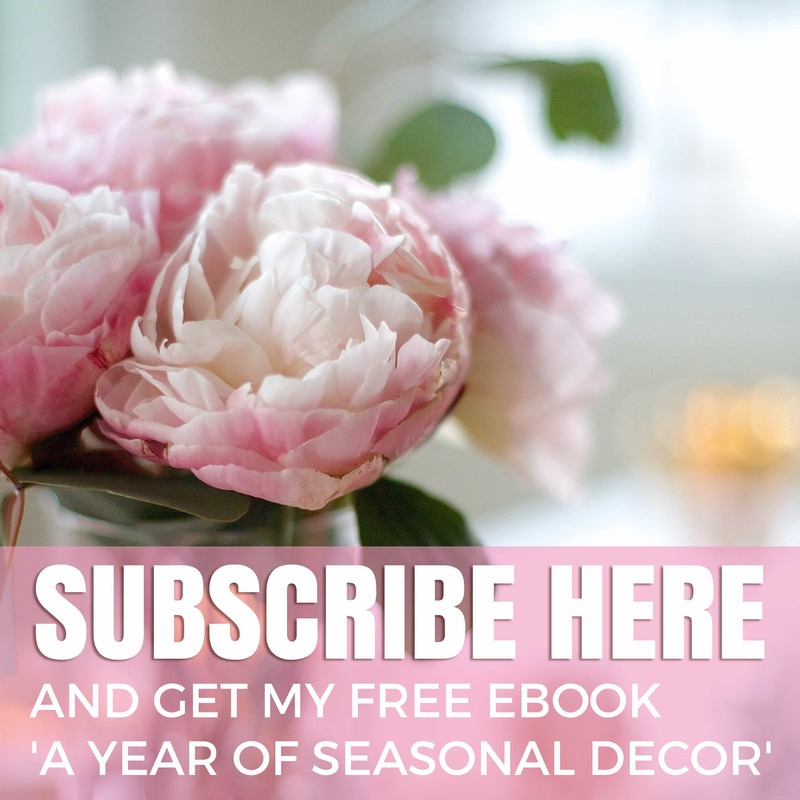 I was delighted to catch the tail end of peony season at the flower market! 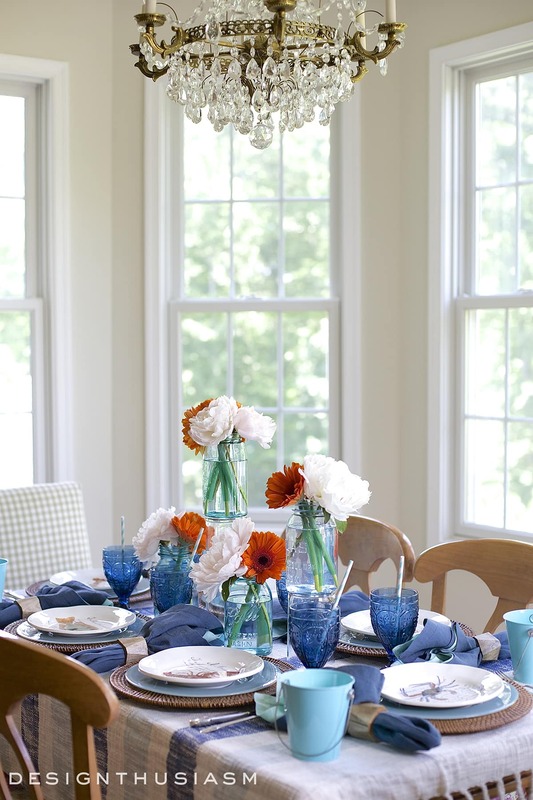 The underpinning of the entire tableau is actually a cotton striped throw that I used as a tablecloth. It has a wonderfully nubby worn look to it that works well with this theme. 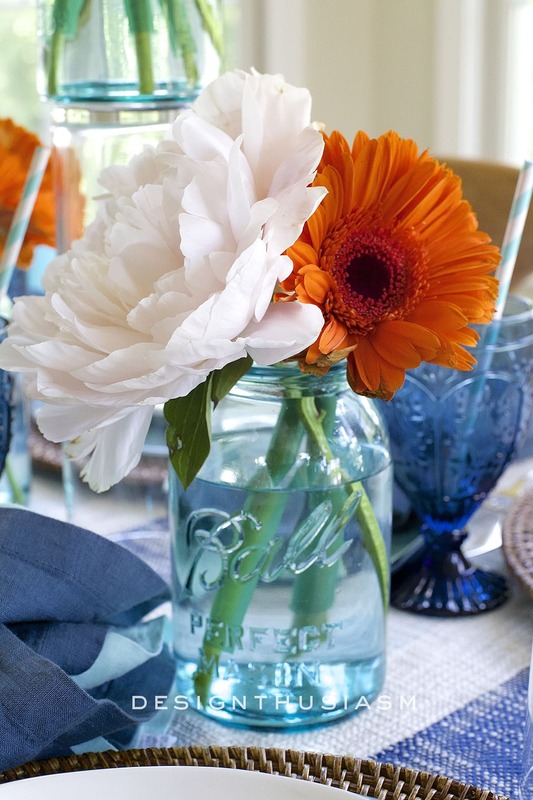 For the florals I used vintage blue mason jars at staggered heights, resting on clear glass upturned vases to avoid blocking views across the table. 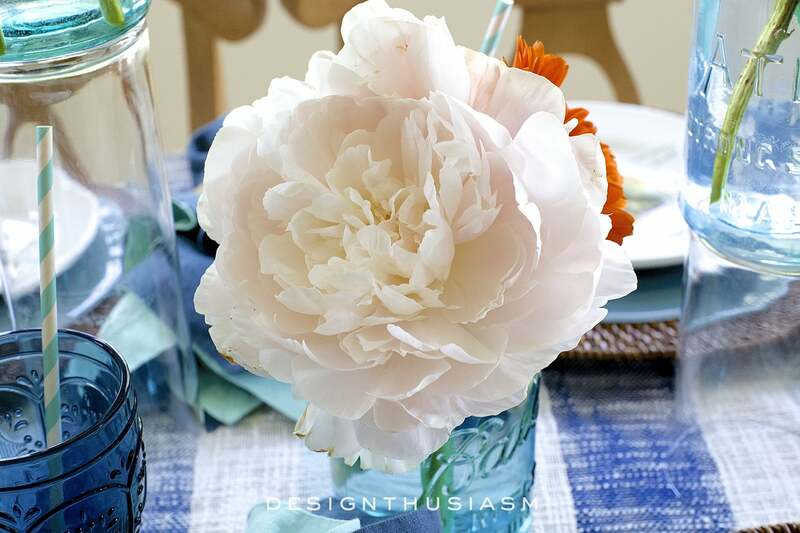 Accompanying the pale blush peonies are russet gerber daisies, bringing out the color in the shellfish on the uppermost plates. 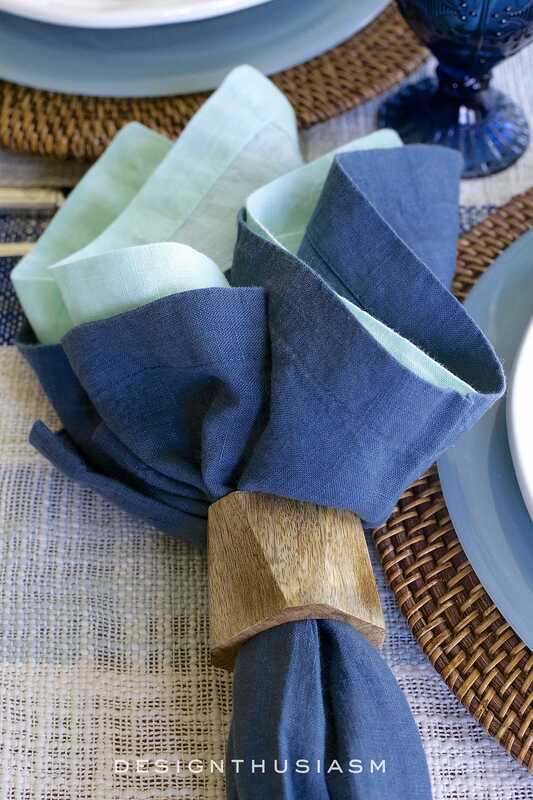 The napkins pair a washed indigo linen outer layer with an aqua linen inner, gathered within a chunky wood napkin ring. 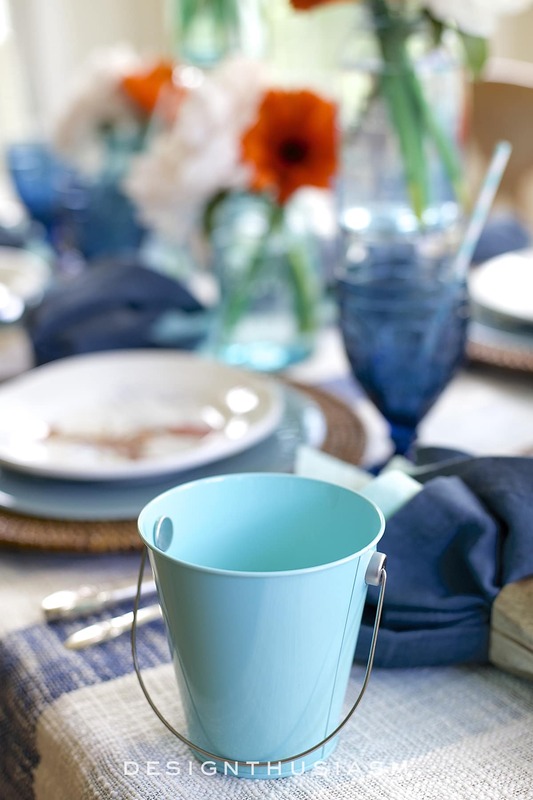 Perky turquoise mini buckets are at the ready to catch tossed shellfish shells. The coastal vibe channels summer at the beach. The palette is an offbeat version of red, white and blue, which hints at the July 4th holiday coming very soon. 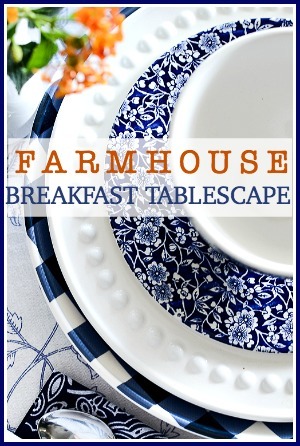 I’m joining with these other bloggers to bring you this monthly tablescape series. 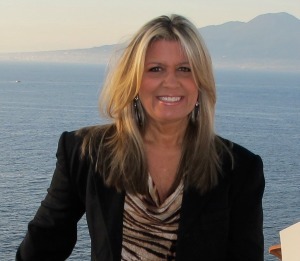 Pretty, Lori! I love the russet gerberas against the blues. Stunning! 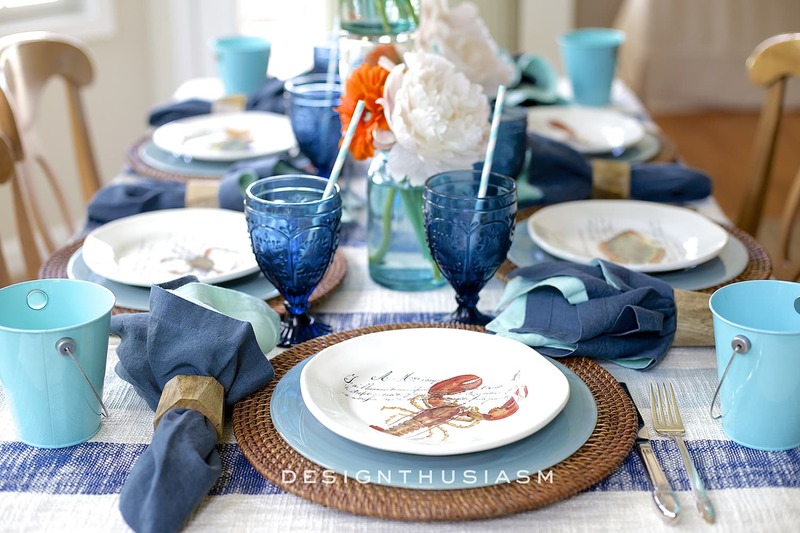 Love it and you have me craving a lobster dinner at 8am:) The colors are so beautiful…..enjoy your day! Perfection! 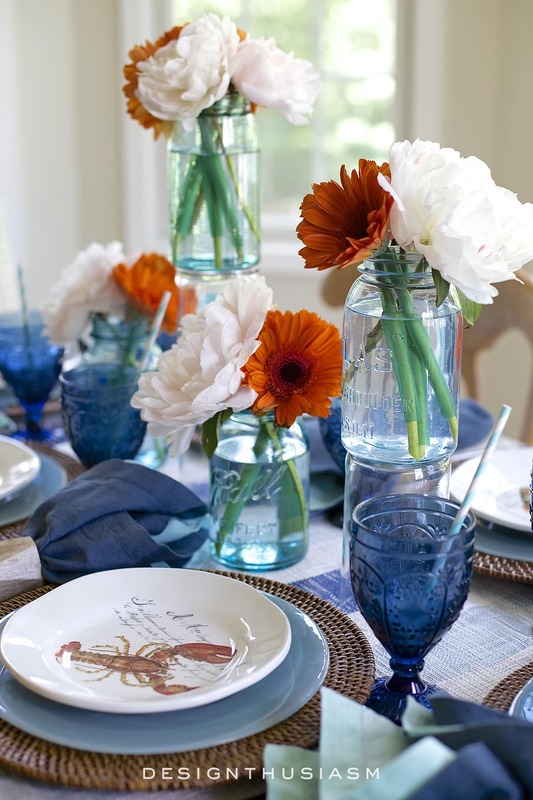 I love every little detail from the striped table cloth to the turquoise buckets and the raised flowers in mason jars — simple and beautiful. I’m ready to pull up a chair! I want to come and have a clambake with you! 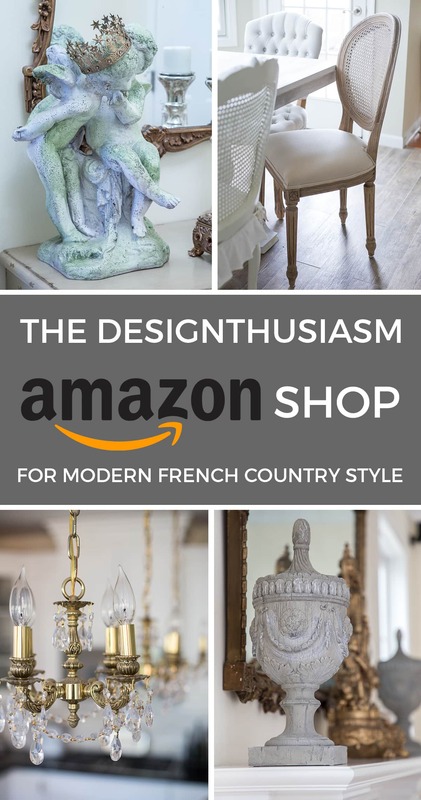 Oh, this table is delightful! 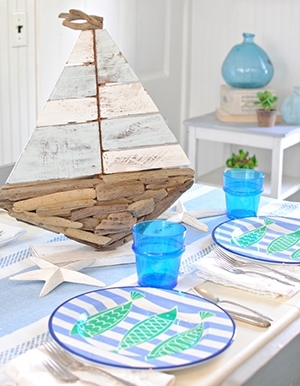 I love the colors, the sea-inspired dishes, the little aqua buckets (how cute!) and the tablecloth. 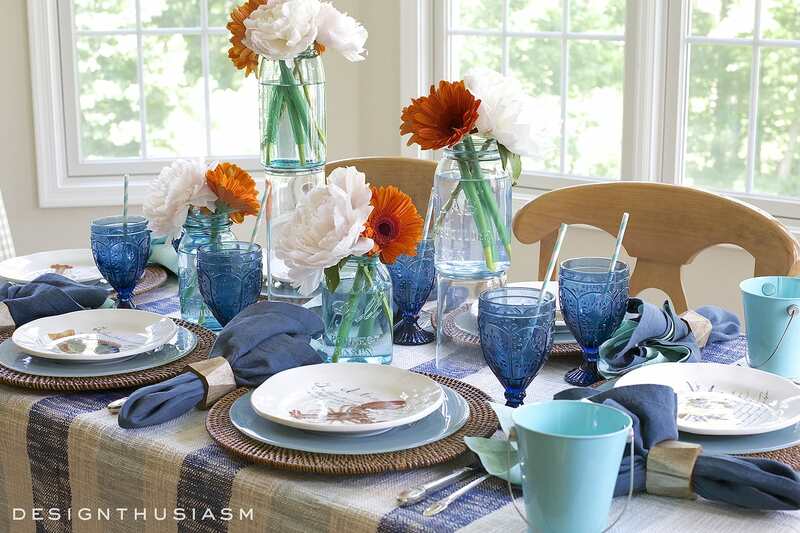 You knocked this tablescape out of the park! I leave so inspired. Very creative and eye catching. Love the colors and textures you wove so beautifully together. Your photos are super. I am envious of your talent. Looks like you have good natural light with all the windows but you have the gift of styling and working your camera for sure. 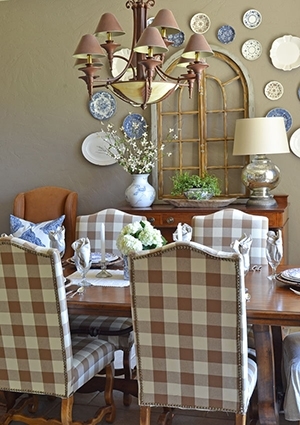 Lory, your tablescape is gorgeous! 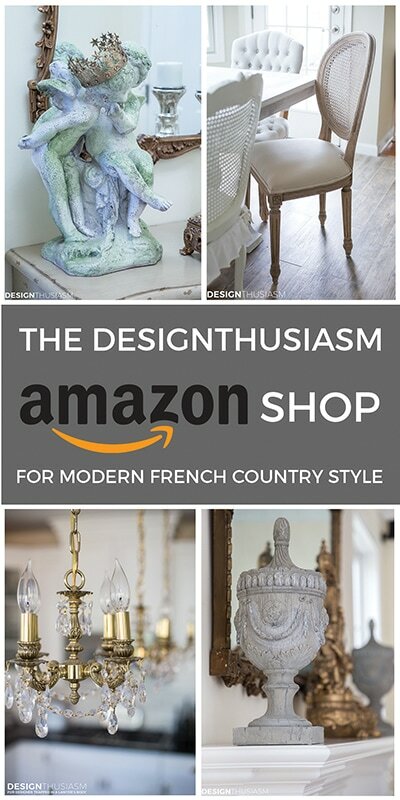 I had just looked at the salad plates, on the World Market site last week, to use with my rattan chargers. 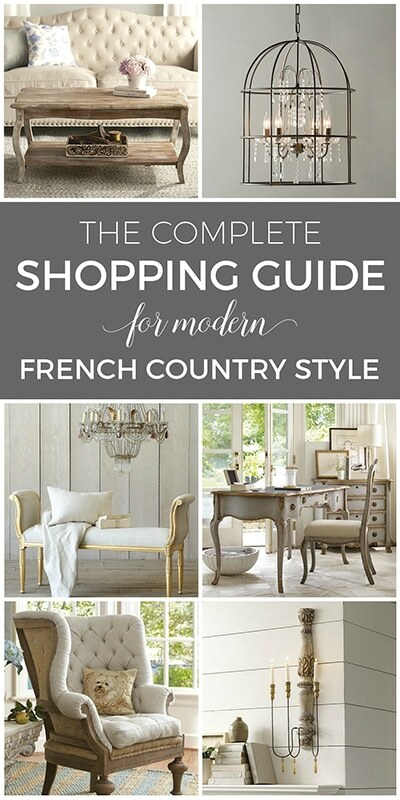 You have inspired me to make a purchase. 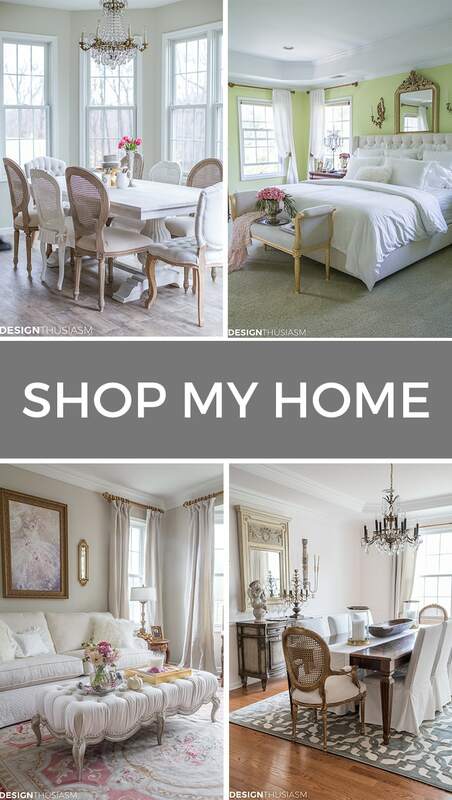 We seem to like the same things, as I’ve noticed in a lot of your tablescapes. You have such a great eye! I have these same coastal dishes. It was fun to see what you did with them. Wow! This is really summer LOVE. 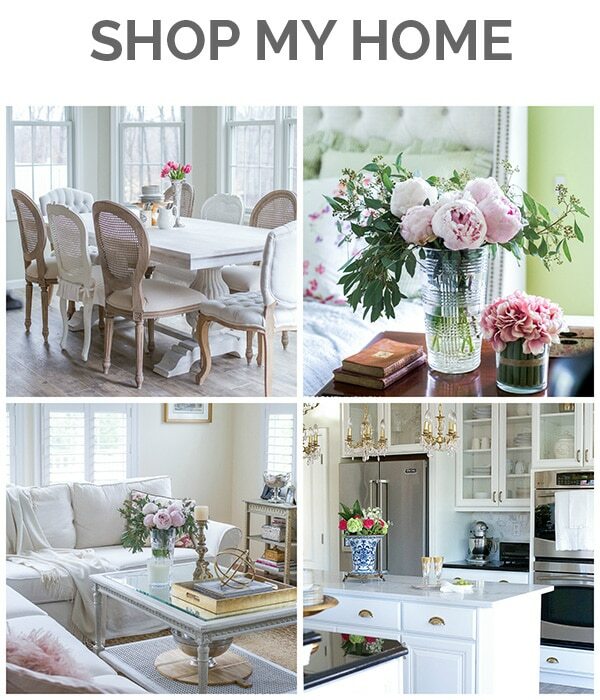 What a beautiful tablescapes. Love the goblets.